A while back I wrote a post about things I no longer cared about - hair, make-up, bathing. It was pretty gross, but as a Mom on mat leave, I wasn't alone (and I felt in good company with all the comments that post received). Now that I'm back at work, my time is even more limited. But now I'm out in public every day, and quite frankly, do not want to be the "stinky kid in the class" a la Big Daddy's Julian. So I shower - every day. And I put make-up on - every day. But one thing that still needs help is my hair. However, other than my roots, you'd never know I have been to a salon in almost half a year. And that's thanks to Vidal Sassoon's new Pro Series line, which debuted in stores last month, bringing salon genius to my home because I clearly can't get to a salon. Vidal Sassoon Pro Series Moisture Lock Shampoo aids in conditioning the cuticle while hair is in its wet shampoo state to make styling after washing easier. Vidal Sassoon Pro Series Moisture Lock Conditioner helps to seal in moisture and prevent dry or damaged-looking hair, leaving it noticeably smooth and irresistible to the touch. Vidal Sassoon Pro Series Boost & Lift Foaming Air Mousse was created after learning that consumers want touchable volume that will last and won’t weigh hair down. It uses an exclusive foam technology that helps control unruly hair while providing up to 24 hours of flexible hold and volume that is easy to comb out. Vidal Sassoon Pro Series Repair & Finish Spray helps seal in style and tame flyaways with Glycerin that significantly helps reduce friction and mechanical damage caused when combing or brushing hair. Vidal Sasson The Mega Firm Hold Gel uses a professionally inspired formula offering a customizable and strong hold that helps lock out style-stealing frizz for up to 24 hours. One YYZ Bambina reader will treat their luscious locks to salon genius from the new Vidal Sasson Pro Series with the five products outlined above and a coupon for a box of Vidal Sasson Hair Colour valued at $56 (approximately) total. Open to Canadian Residents who are the age of majority only. Valid entries only. Contest ends Wednesday, March 27, 2013. By entering the following contest you are accepting that if you win your contact information will be shared with a P&G PR agency for the purpose of mailing your prize. This giveaway may appear on other blogs as part of the #PGmom program, however, to be fair, you can only win once per giveaway. If your name is chosen more than once, another winner will be selected. For further contest rules, refer to the Terms and Conditions within the Rafflecopter. the moisture lock conditioner for sure!! I lack so much moisture and have lots of frizz! I most need the Vidal Sassoon Pro Series Boost & Lift Foaming Air Mousse cause I have thin hair which needs a boost! In my next life I'm going to have thick hair and thin hips instead of the other way around. I most need the Vidal Sassoon Pro Series Boost & Lift Foaming Air Mousse cause I have very thin hair that needs a boost. In my next life I'm going to have thick hair and thin hips instead of the other way around. 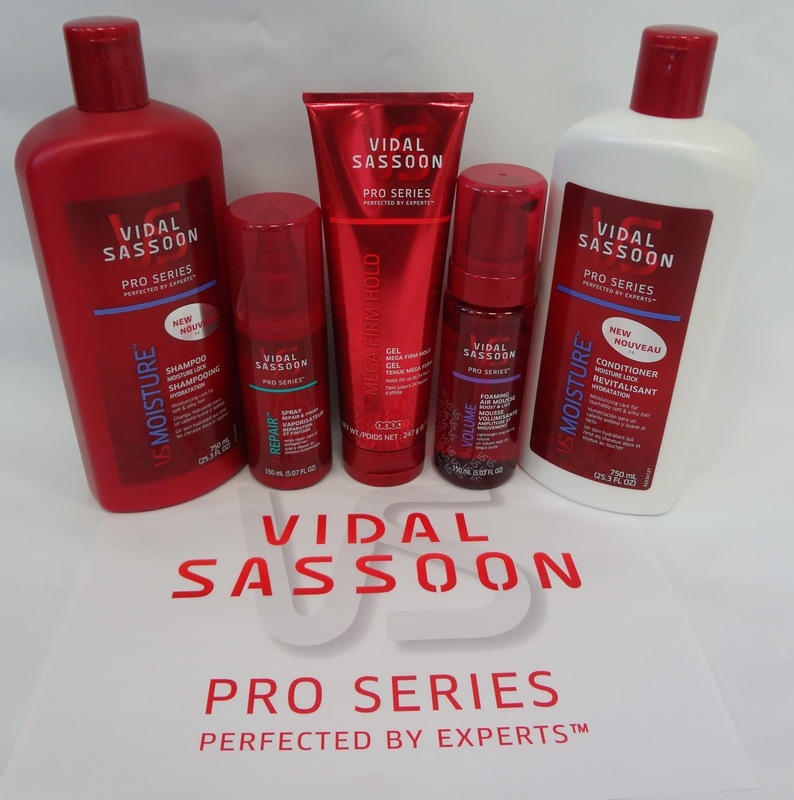 Th Vidal Sassoon Pro Series Moisture Lock Shampoo for me to help with styling my long locks! I'd love to try the Vidal Sassoon Pro Series Moisture Lock Conditioner for my dry hair! The mousse. My hair is pretty limp and boring! I think right now, my hair would drink the Vidal Sassoon Pro Series Moisture Lock Conditioner! This winter has been really drying to hair. my hair needs the moisture lock conditioner. My hair needs the Vidal Sassoon Pro Series Repair & Finish Spray to tame the flyaways. The shampoo. Some shampoos strip too much from my hair. I most need the Moisture Lock Shampoo. I think I need the Vidal Sassoon Pro Series Moisture Lock Conditioner the most. I need this one the most: Vidal Sassoon Pro Series Repair & Finish Spray. It could help with the flyaways. Right now I need the Vidal Sassoon Pro Series Moisture Lock Conditioner the most. My hair is so dry and tangly lately. The the moisture lock conditioner to reduce my frizzies and smooth out the ends! my hair needs Vidal Sassoon Pro Series Repair & Finish Spray. My hair could use the Moisture Lock Conditioner. The repair and finish spray would be so helpful. The repair and finish spray would be helpful and quick for those rushed mornings. I would be excited to try out the Vidal Sassoon Pro Series Boost & Lift Foaming Air Mousse. I use styling mousse all the time. I need the Vidal Sassoon Pro Series Boost & Lift Foaming Air Mousse the most! My hair needs Volume badly! I could use the repair and finish spray. My hair could most use the Vidal Sassoon Pro Series Repair & Finish Spray. My hair needs the conditioning the most. My hair is long and thick and long past due for a trim. The ends are in need of repair. I think the Vidal Sassoon Pro Series Moisture Lock Shampoo and Conditioner.